New infographic outlines 5 steps to creating more accurate estimates driven by complete costs. When you know your true costs from subcontractors to materials and overheads, you can master the bidding process for construction projects and win more jobs. What you need are the right tools and processes for accurate costing. That’s where Acumatica comes in. We’re helping construction companies develop costing strategies that work. And we’ve outlined the steps in a new infographic. Track accurate project costs from start to finish. Use technology to save you time and improve your accuracy. Tailor real-time reports to help you stay on top of change orders. Capture the cost details of project close-out. Take the headaches out of construction accounting. Don’t miss this chance to simplify your bidding process for construction projects. View the infographic now. 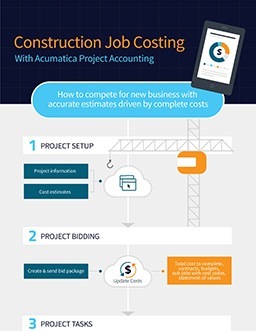 This infographic is offered by Acumatica, a leading provider of cloud business accounting software that gives mid-sized contractors a complete, real-time view of their businesses—anytime, anywhere.